THIS LOT CONSISTS OF LEGO SET 6244-1 IMPERIAL SENTRY AS PER TITLE. Sets: Pirates: Pirates I: Imperial Armada AS THE MAJORITY OF OUR LEGO IS PRE-OWNED, OUR LEGO GRADING SYSTEM IS THEY MAY HAVE SCRATCHES, TEETH MARKS, SLIGHT DISCOLORATION OR NOT BE AS SHINY AS THEY ONCE WERE, BUT UNLESS OTHERWISE STATED THEY WILL NOT BE BROKEN AND THE PIECES WILL STILL FIT TOGETHER. LEGO Harry Potter Draco's Encounter with Buckbeak (4750). COMPLETE SET WITH INSTRUCTIONS. LEGO DUPLO BASE BOARDS. IN GREY BROWN BLACK BLUE AND GREEN. ALL LOVELY CONDITION. LEGO DUPLO BASE BOARDS. ALL LOVELY CONDITION. THERE ARE TWO 12 X 6. (2) Buildings (4406). 1) Building Stories With Nana Bird (4177). Building Stories with Nana Bird is a LEGO Creator set released in 2001. 2 LEGO Creator Sets. In very good condition. No ideas book included but it can be downloaded from lego site. Pieces are in good clean condition. Age group 8 to 12 years. Complete - I have double checked all parts are present. Instructions are included. Bricks are in good condition. Picture is just example of selection of bricks available. These are bricks and parts Picked out of a large selections of bricks. Theres wheels, minifig parts, minifig accessories, bricks, slanted bricks, flats, coloured bricks, transparent pieces, and a mix of lego technic. REMOVED FROM SET 76108. LEGO SUPER HEROES SANCTUM SANCTORUM BUILDING ONLY. YOU ARE PURCHASING THE BUILDING ONLY (UNASSEMBLED WITH INSTRUCTION BOOKLET). CONDITION : NEW (unassembled). LEGO 60200. For sale is the Sports Car split from set 60200: Capital City. Lego Ninjago 70728 / Battle For Ninjago City. Discontinued item ! Complete assembled figure only - no trap. I’m having a Wife enforced clear out of lego which I haven’t built yet including 2 other architecture sets. It is New Sealed and smoke free. Looks like a fantastic set. If it's new ill have marked it as such. Here for sale is a Lego 16 X 16 Dark green base plate 91405. It is in good used condition. LEGO DUPLO MY FIRST ZOO 6136. LEGO Art carousel and pencils / sharpner / crayons. This set is in excellent condition and is 100% complete with the original box and instruction manuals. The box is slightly creased in the middle on the back. LEGO Harry Potter Hagrid's Hut (4707). COMPLETE SET W/ INSTRUCTIONS. LEGO SET 40260 HALLOWEEN HAUNT NEW. Brand new sealed box Condition is New. Dispatched with Royal Mail Signed For® 2nd Class. From smoke/pet free home. Complete set of DUPLO Superman Rescue. Set number 10543. In good used condition. Incomplete -missing the orange blanket and the red bed curtains - I have double checked all other parts are present. The cardboard backdrop is present. Pieces are in good clean condition. Instructions are included. Set 7240 From 2005. Lego City Fire Station. Including a spare set of new stickers. Not full set, might be pieces missing but works well and loads of fun and no minifigures. AS THE MAJORITY OF OUR LEGO IS PRE-OWNED, OUR LEGO GRADING SYSTEM IS Sets: Town: Classic Town: Fire THEY MAY HAVE SCRATCHES, TEETH MARKS, SLIGHT DISCOLORATION OR NOT BE AS SHINY AS THEY ONCE WERE, BUT UNLESS OTHERWISE STATED THEY WILL NOT BE BROKEN AND THE PIECES WILL STILL FIT TOGETHER. Here is Lego Mixels set 41510 - Lunk, from series 2. Lego Creator No: 7803 - Jeep. All parts - none missing. THIS LOT CONSISTS OF A LEGO SET 197-1 Farm Vehicle and Animals AS PER TITLE. AS THE MAJORITY OF OUR LEGO IS PRE-OWNED, OUR LEGO GRADING SYSTEM IS THEY MAY HAVE SCRATCHES, TEETH MARKS, SLIGHT DISCOLORATION OR NOT BE AS SHINY AS THEY ONCE WERE, BUT UNLESS OTHERWISE STATED THEY WILL NOT BE BROKEN AND THE PIECES WILL STILL FIT TOGETHER. THIS LOT CONSISTS OF A LEGO SET 5560-1 Large Pink Brick Box AS PER TITLE. AS THE MAJORITY OF OUR LEGO IS PRE-OWNED, OUR LEGO GRADING SYSTEM IS THEY MAY HAVE SCRATCHES, TEETH MARKS, SLIGHT DISCOLORATION OR NOT BE AS SHINY AS THEY ONCE WERE, BUT UNLESS OTHERWISE STATED THEY WILL NOT BE BROKEN AND THE PIECES WILL STILL FIT TOGETHER. AS THE MAJORITY OF OUR LEGO IS PRE-OWNED, OUR LEGO GRADING SYSTEM IS THIS LOT CONSISTS OF A LEGO SET 335-1 Basic Building Set AS PER TITLE. THEY MAY HAVE SCRATCHES, TEETH MARKS, SLIGHT DISCOLORATION OR NOT BE AS SHINY AS THEY ONCE WERE, BUT UNLESS OTHERWISE STATED THEY WILL NOT BE BROKEN AND THE PIECES WILL STILL FIT TOGETHER. LEGO Harry Potter Aragog in the Dark Forest (4727). COMPLETE SET WITH INSTRUCTIONS. LEGO 41094. FRIENDS: HEARTLAKE BEACH HOUSE. 100% COMPLETE WITH INSTRUCTIONS. Sets: Indiana Jones: Raiders of the Lost Ark THIS LOT CONSISTS OF A LEGO SET 7621-1 Indiana Jones and the Lost Tomb AS PER TITLE. AS THE MAJORITY OF OUR LEGO IS PRE-OWNED, OUR LEGO GRADING SYSTEM IS. Lego Police Building Set. May be a little dusty in places, may be missing stickers. 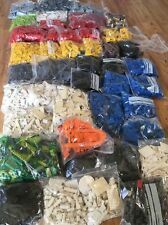 THIS LOT CONSISTS OF A LEGO SET 4131-1 FREESTYLE BUILDING SET AS PER TITLE. Sets: Freestyle AS THE MAJORITY OF OUR LEGO IS PRE-OWNED, OUR LEGO GRADING SYSTEM IS THEY MAY HAVE SCRATCHES, TEETH MARKS, SLIGHT DISCOLORATION OR NOT BE AS SHINY AS THEY ONCE WERE, BUT UNLESS OTHERWISE STATED THEY WILL NOT BE BROKEN AND THE PIECES WILL STILL FIT TOGETHER. Lego Exoforce 7702 (2006) Thnuder Fury. Complete with instructions. (189 pieces) Including instructions in a very good condition. It does not include the box.